You can find Nathalie here and here on Ravelry. Another source of inspiration I appreciate is allegedly “stupid” questions asked by allegedly less experienced knitters who apparently don’t know as much “don’t”s as more experienced of us have faced already. In fact that leaves less experienced knitters unsatisfied about some solid knitting axioms the more experienced ones just don’t question anymore. Like, stockinette curls, left-leaning decrease jags, last (or first) stitch of a wide ribbing or a cable is always loose, etc. I see such questions as an opportunity to maybe change something, to the good of the whole knitting community. At least, to try. Oftentimes I browse through the stitch pattern dictionaries for a particular stitch, and then something unrelated catches my attention and I mark the page to return to it later. In some cases I have to adjust said stitch pattern to my knitting manner (I knit Continental Combined, so, say, massive purling through the back loop on WS isn’t an option), and this may present interesting challenges. I also sometimes get inspired by music (both songs and instrumentals) and literature, and I’d want to say that yarn whispers to me as well, but the truth is the squishy stuff only knows two words: “BUY ME!” ;) I try to listen to it, though, anyway, and if it doesn’t want to be a certain project, it’s better not to force it. Not sure it qualifies as a technique, but I am really passionate about calculating set-in sleeves (based on Priscilla Gibson-Roberts percentages). I also am very fond of integrating shaping with patterning so one grows out of the other naturally emphasizing the overall effect. And I think I will always admire the logic behind traditional Orenburg lace. So far the majority of my patterns have grown out of personal projects tailored to specific individuals, so they come one-sized and are hardly customizable, because usually my designing intent is to get something unique for a person I thought about in the process rather than something universal any knitter could reproduce. I mean, I feel flattered every time someone chooses my patterns, but most of them are designed so you either make them as written or don’t make at all. 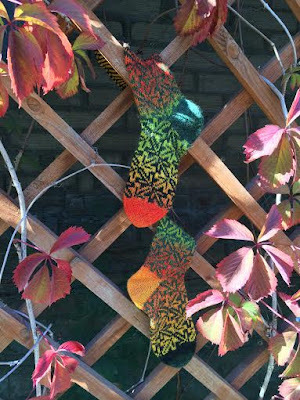 Then in August 2013 I’ve published “Exotic Whirlpool” socks, and in December 2013 Jeny Staiman’s “Wraptor” socks were published by Knitty webzine. From explanations on her blog it looks like we came up with our ideas roughly at the same time! So I see no point in hiding in ivory tower – you still can accidentally catch the wave, so it’s better to be aware of what’s happening around. For me, knitting is never only about mindlessly forming stitches. 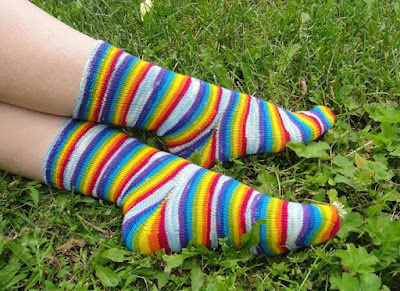 I believe a true knitter should understand what happens on their needles every single moment, and such understanding is a great part of knitting pleasure as I see it. If one doesn’t want to understand and only wants a new FO, then maybe they should find a ready-to-use item instead of trying to make it. 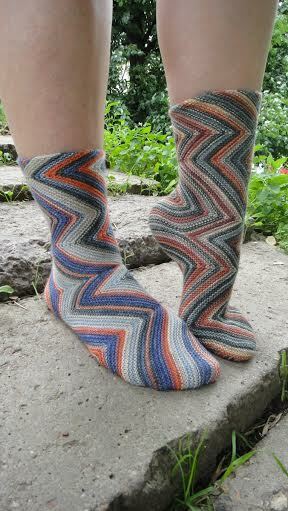 Usually I knit samples myself and then patternize them, this way I am sure the thing works not only in my head. But then I try to run a test to make sure the thing works for other knitters as well. I have some followers who very kind-heartedly greet my patterns, so I notify them about chances to sneak peek, but my tests are open to everyone. I try to publish something every year, 3 patterns being the bare minimum. Regarding business, I think I am probably the worst kind of an indie designer (from a designer’s point of view) – since I am able to come up with attractive remarkable patterns that I unleash to run for free, thus undercutting the market for those who design for living. But I see it slightly differently. There are several modern sock designers who self-publish outstanding patterns free of charge, like General Hogbuffer and Caoua Coffee, and I am proud to be among them. I’d love to have one, though maybe not for knitting but for business-related stuff as I seem to have no business bone in me. I know it sounds contradictory to what I just said about pride and all. See, over here small businesses like selling patterns aren’t very common, but according to our tax rules one should pay obligatory social taxes even without any business activity, let alone profit. Plus don’t forget the current exchange rates aren’t very favorable for Russian ruble now: either my prices in other currencies would be lower than average (so I’d be underselling against international designers), or my prices would be extremely high for local customers thus repelling them (which I find kind of unnatural); and a typical Ravelry price was already considered pretty high even when the exchange rates were more tolerable. As for knitting, I’d love to have a mentor, say, 20 years ago, even someone who would just direct me to a knitting bible like “Azbuka vyazaniya” (“Knitting ABC”) by Margarita Maksimova that could save me years of trials and errors. On the other hand, I wouldn’t be the one who I am now without those trials and errors, so I don’t regret the ways I’ve gained my experience. 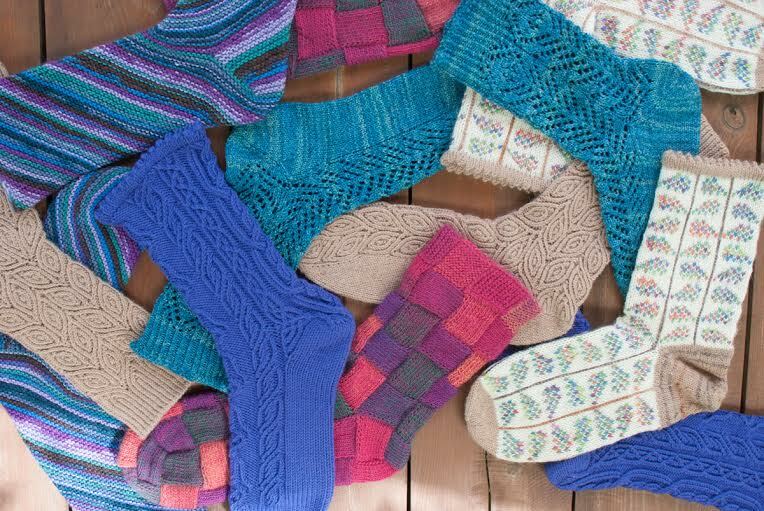 Since my self-published patterns are free, I politely ask my English-speaking knitting friends to check my scribbles, plus I always ask the testers to point out for all the kinks they may encounter. And when I designed on commission, the publisher provided the TE thing. I actually liked that part of the work most! Tech editors are like fitness trainers for words and they can do miracles to unshaped wall of text, loose and messy, transforming it into a handsome wording anyone would be happy to follow. That’s simple. Since my daily work has nothing to do with knitting, I spend all my free time knitting. Well, also playing video games, sewing, reading, watching anime and movies, etc. What advice would you give someone who wants to pursue a career in knitting?The only thing I know is that you should design the stuff you love. Very interesting - I appreciate it and thank you! I have admired and appreciated Nathalie ever since I came upon her having found Ravelry a few years ago. Thank you for showcasing her in your fascinating interview. Linkedin - How Are You Using It?